Give to your research! 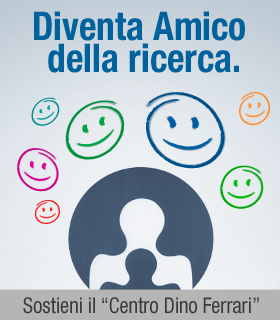 Become a Friend of “Centro Dino Ferrari”, you will join our big family of support and solidarity for scientific research. Give the amount you chose by credit, debit or prepaid card.. After donating, if you chose, you can appear in the donor’s list of “Amici del Centro Dino Ferrari”. According to art. 13 of D.Lgs 196/03, we inform you that all personal data voluntarily given will be treated in full respect of current laws on the matter. The Association will treat personal data received in the carrying out of its activity, laid out and described in the statute; by way of example and without limitation, among which is the promotion of various cultural activities and the collection of funds which will be designated to the promotion of clinical and scientific research. The collection and treatment of data for the aforementioned scope, may or may not be carried out automatically, but will nonetheless be held in respect of privacy and security regulations set out in law. The information gathered through the website of the Association, www.associazionecentrodinoferrari.com, will be used to manage donations made by the interested party and also to send eventual communications also in paper form. Data will only be handled by those eventually responsible and named by the association in merit as Holder of the treatment. Other than with regards to navigation data, the submission of data is optional and any eventual withdrawal will incur no consequences, other than the impossibility to connect and/or contribute a donation to the Association, or to receive information material. The holder of treatment is Associazione “Centro Dino Ferrari”, in Milano, via Francesco Sforza, 35 – 20122 Milano.